New York City's Housing Crisis: ISO 2 Affordable Bedrooms In NYC? Good Luck With That Apartment buildings are going up all over Manhattan, but it's harder than ever to find an affordable place to live in New York. It's a scene played out nationwide as rents soar and wages stall. A luxury residential building at 432 Park Ave. (center) is seen in the Manhattan skyline. Rents have soared as demand for apartments outpaces the number available, even with the oversupply of expensive apartments. Over the past few decades, New York City has become safer, richer and a lot more crowded than it used to be. All over Manhattan these days, you can see apartment buildings going up — and yet finding a decent place to live has become tougher than ever. "We are in an official housing crisis, period, in New York City," says Alicia Glen, New York City's deputy mayor for housing and development. "Our population is growing much more rapidly than our housing stock and so we have a really imbalanced housing market." Mayor Bill de Blasio has proposed a plan to ease the housing shortage, but it's encountering opposition from some of the people hit hardest by the shortfall. According to the National Low Income Housing Coalition, New York is the fourth most expensive state to rent a two-bedroom unit. In a city where most people rent, the apartment vacancy rate now is just 3 percent. Glen says in recent years, a lot of new people have moved into the city and there are more single people living alone. Changes in rent control laws caused the city to lose 250,000 affordable apartments over the past few decades, leading to an even tighter market. But the problem of affordable rents is not just in New York. The Harvard Joint Center for Housing Studies found a record number of "cost-burdened" households in 2013 nationally, and the NLIHC reports that the cost of housing has continued to rise as incomes for minimum-wage and low-wage workers have stagnated. And as the housing crisis forces middle-income earners to migrate out of cities, the low-income earners find themselves being pushed out by newcomers. David Infante and Simon Keyes are two buddies from college in their 20s with pretty good jobs. Not long ago, they spent three days looking for an apartment in lower Manhattan. Keyes says they wanted two bedrooms and a dishwasher and they didn't want to walk up too many flights of stairs. "We didn't want to spend more than ... $1,400 per person was the absolute limit and those things combined with the dishwasher made things pretty hard in New York City," he says. Housing activists march to City Hall to demand more affordable housing options for the homeless and poor on Sept. 17 in New York City. Eventually they found something in their price range, but it was in a gritty part of Brooklyn, across from a hospital where they often hear sirens. Infante says he expected to have trouble finding a place to live in New York. It's almost part of the glamour of the place, but it wears you down. "If you sort of did an exit poll on people who did five years in New York, 10 years in New York and decided to get out, housing and the constant runaround of it would probably be something that everyone cites, or at least most people," Infante says. "That's something that will probably ultimately drive me from New York, for example." In New York, after controlling for inflation, median rents have increased 12 percent in eight years — at a time when incomes are up just 2 percent, says Ingrid Ellen, professor of public policy and urban planning at New York University. "Low-income households are struggling to pay their rent in every city in the United States," Ellen says. 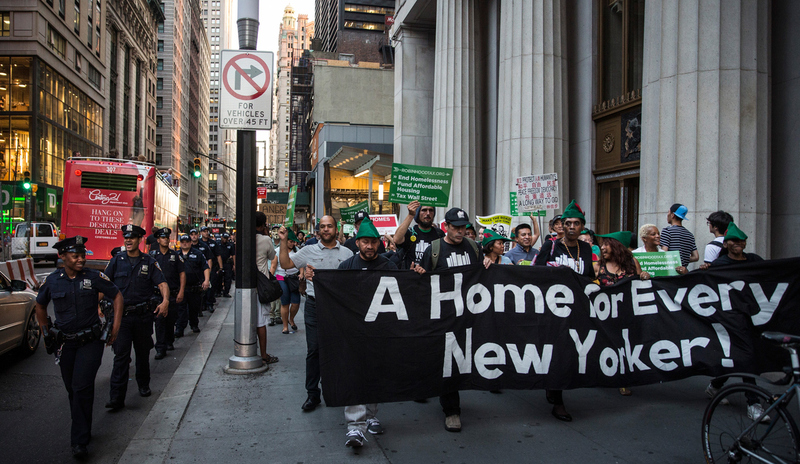 "And what really makes New York City stand out is that moderate-income renters are struggling." City officials are worried that a lot of people will be driven from the city. Landlords typically demand that prospective tenants have $40,000 in annual income for every $1,000 in rent, which means a six-figure income will get you a pretty nice one-bedroom in much of Manhattan and Brooklyn. "It may be hard for somebody who lives in the Midwest or the South to believe that you could make $100,000 a year here and have a family of four and not be able to find an affordable place to live," says Glen, the deputy mayor. "But a $100,000 a year could be a teacher and a nurse, and those people are the lifeblood of New York City." Glen says new housing is being built in New York, but the high cost of construction and land makes it hard for developers to earn a profit except at the high end. 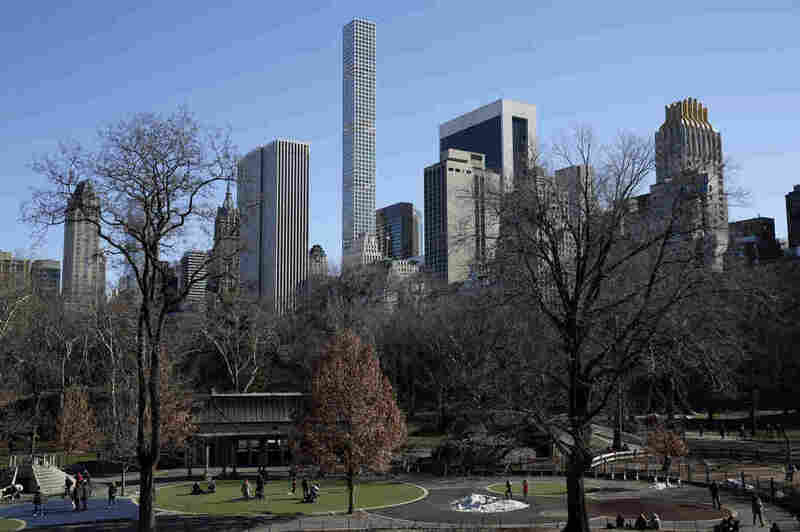 Douglas Wagner, an executive at a real estate firm in New York, says even as competition for affordable housing surges, there is an oversupply of expensive apartments — places that start at $8,500 a month. "Now especially in better buildings, there are a lot of empty apartments looking for tenants and for the first time in some time, offering major incentives to get tenants to take apartments at this level," he says. 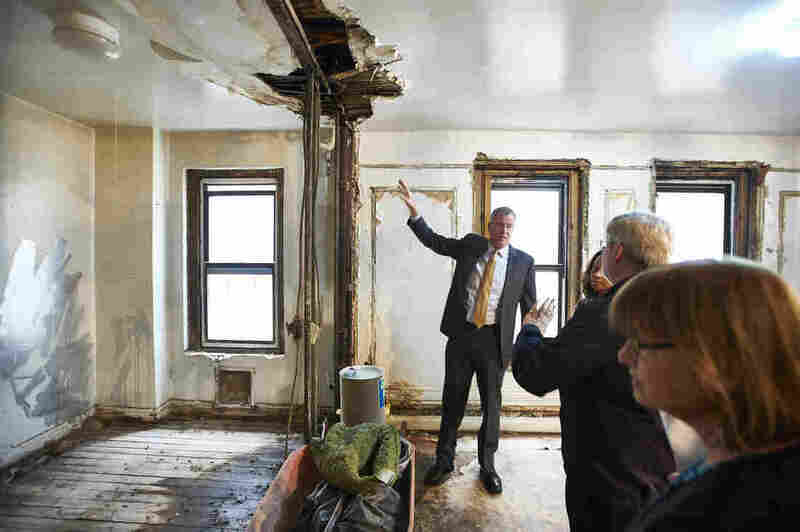 New York City Mayor Bill de Blasio (left) tours an apartment under renovation in the Bronx borough of New York last April. The building is one of four buildings that will lock in a 30-year affordable rental agreement. Mayor de Blasio has a plan to ease the housing shortage by rezoning some neighborhoods to allow more construction and requiring developers to build more affordable housing. Bedford-Stuyvesant is a neighborhood in Brooklyn once synonymous with crime and urban neglect. Now, it attracts a lot of young people who move there in search of affordable rents. BRP Cos., a real estate developer, is taking advantage of the opportunity. "There had been a lot of disinvestment, but the bones were there and it was a close commute to Manhattan and we just thought it was a good bet for development," says Andy Cohen, director of the company. BRP is a for-profit company, but many of the apartments it builds are set aside for low- and moderate-income people with the help of tax credits and other government programs. Using developers like BRP, the de Blasio administration plans to build or preserve some 200,000 affordable apartments. "We put together what has been characterized as the most ambitious and comprehensive affordable housing plan in the country by far," Glen says. The plan would harness some of the intense development pressure sweeping the city. The mayor wants to rezone neighborhoods like Bedford-Stuyvesant to make it easier for private developers to build by modifying some of the zoning regulations that drive up costs, such as building height restrictions or the requirement that apartment buildings have underground garages. Jerilyn Perine, executive director of nonprofit Citizens Housing and Planning Council, says a lot of these regulations are obsolete. "Department of City Planning now is really trying to sort of step back and say there were things that were done, particularly in the mid-'80s, they were good ideas, they were helpful then. But now we really need to make sure that we can add to our housing stock," she says. In exchange, the city would force developers that want to build in the city to construct more affordable apartments, Glen says. "It's both attacking it from a supply-and-demand perspective, but then saying the market alone will not actually solve this problem," she says. "We need to aggressively subsidize and use every tool we have to make sure that we're bringing on enough affordable housing." But the plan is encountering opposition from some of the people hit hardest by the housing shortage. The housing shortage is driving more and more middle-income New Yorkers into the further reaches of Brooklyn and Queens, bringing a new wave of gentrification that threatens to displace a lot of low-income people from those neighborhoods. The mayor's plan has encountered opposition in some of the poorest neighborhoods. The buildings, like a BRP apartment in Brooklyn called the Bradford, are designed to house people of different income levels. Gone are the days when large projects were built to house huge groups of poor people. "We think generally it's better to have a mix of incomes living in a neighborhood rather than either a low or high income because you just get a more vibrant community," Cohen says. The Bradford houses some very poor people, but the largest group of tenants is moderate income, which in New York can mean an annual salary of $120,000 for a family of four. The rent they pay to live there can reach $2,400 a month. That puts it well out of reach for a lot of the neighborhood's poorest residents. Rachel Rivera, a mother of six, showed up at a town hall meeting in East New York to protest the mayor's plan. Rivera lives on disability. She says local landlords are already pushing people out of their apartments to lure newcomers with higher incomes and she worries that there won't be enough apartments for people like her under the rezoning plan. "What I'm worried about is that I get pushed out and I won't be able to afford these 'affordable housing' that they say that they're going to put up," she says. City officials are aware of concerns like Rivera's. But they say allowing a mix of incomes is the best way to make sure buildings stay economically viable. They also say that by replacing some of the city's low-rise neighborhoods with higher-density apartment towers, they will ultimately be able to build more low-income housing. As a wave of development pressure is washing over New York, the challenge now is to channel that pressure to build the kind of city that New Yorkers want.